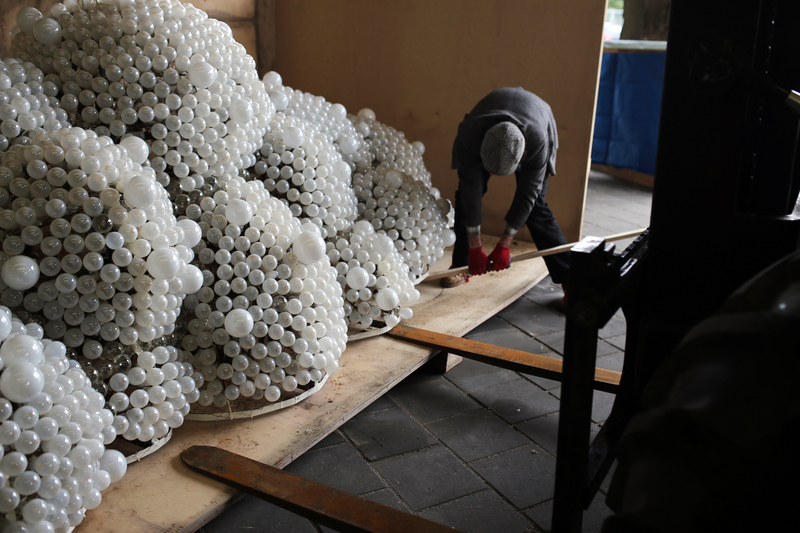 14 hours of air travel later, beyond the ocean and over the clouds, we found ourselves in Eindhoven, Netherlands, preparing for the next in a growing (and exhilarating) series of European light festivals: GLOW Forum of Light & Architecture. Opening our massive CLOUD crate for the second time since the beast was packaged in Russia, we collectively held our breath, preparing for the unknowable. How did CLOUD fair in transit? How long would it take us to repair her, bathe her, coddle her, and prepare her for decent public exposure? With only three days until our deadline, would we have enough time? 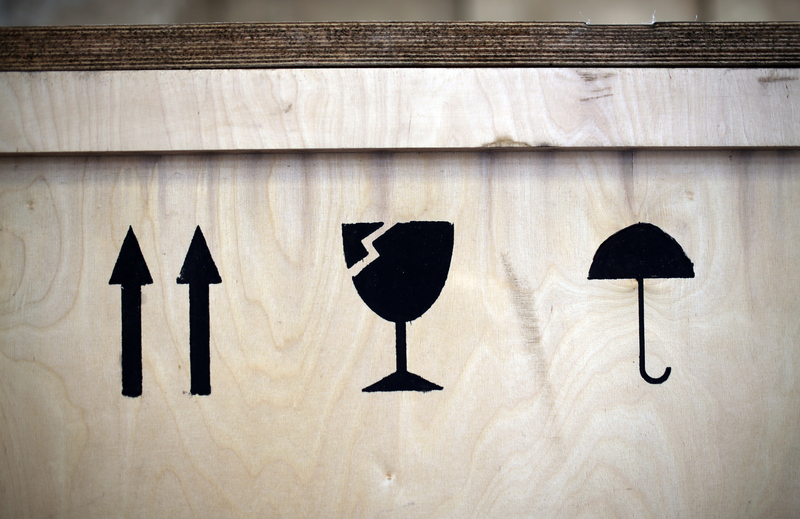 Several long, tense moments later, Wayne opened the crate and we expelled a sigh of irrepressible relief. 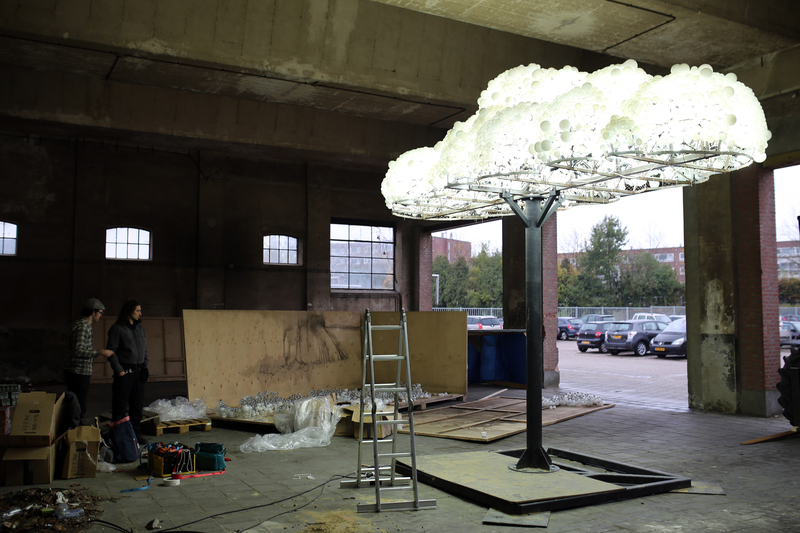 Besides two dislodged bulbs, CLOUD was virtually undamaged in transit from Signal Festival in Prague to GLOW Festival in Eindhoven – about 650 km by road. 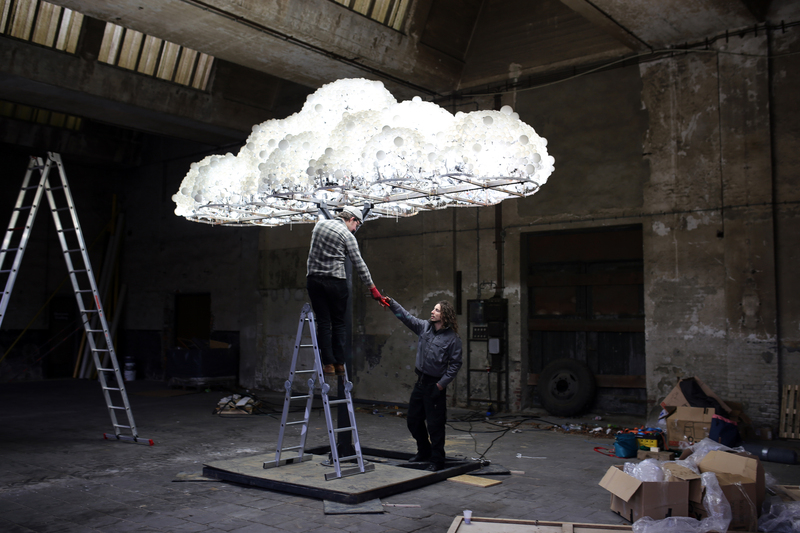 This is the most complete CLOUD has ever been prior to installation – a small miracle and an absolute treat! 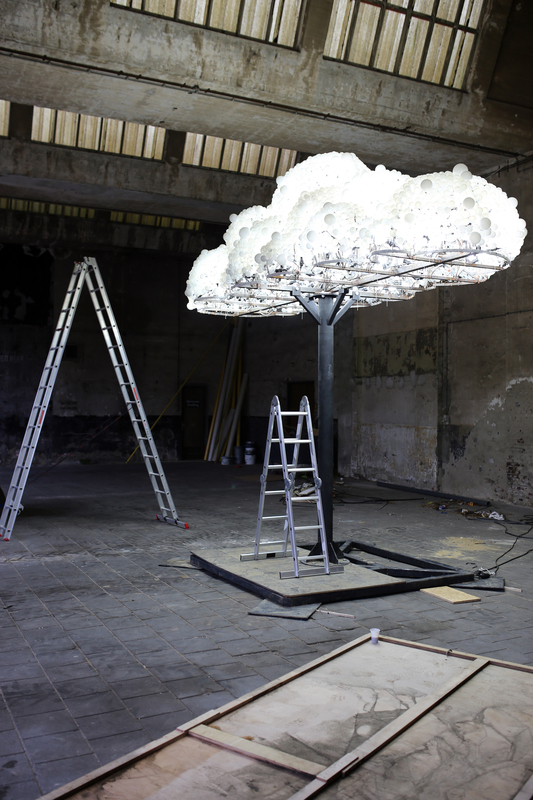 Having heard briefly about the semi-industrial CLOUD site in advance, were curious to view our space in Eindhoven. 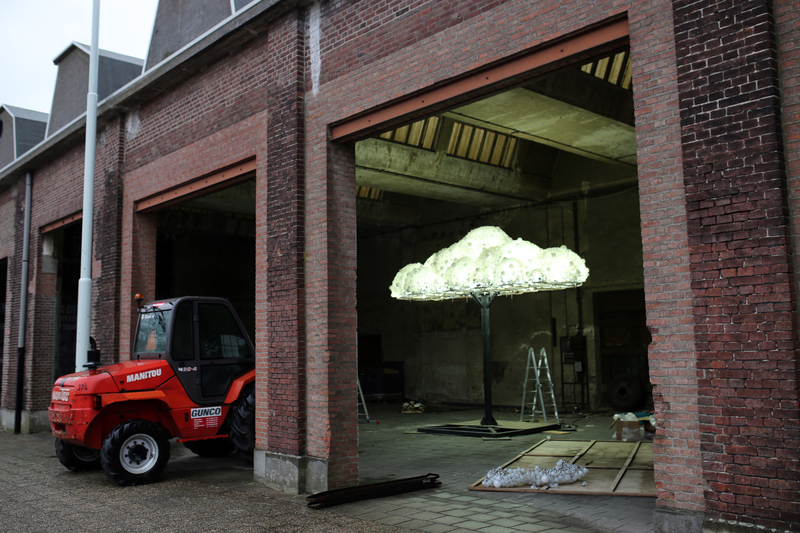 The location for CLOUD at GLOW is a faintly historic truck garage in an old utilities building. 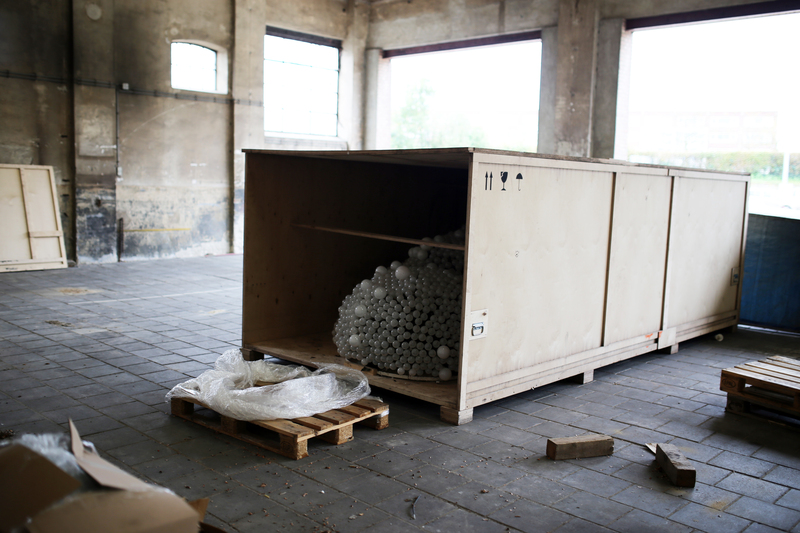 Rough, dirty, mysterious, and delightfully utilitarian, we were pleased as punch with the choice of venue – not just because it strikes a fitting juxtaposition with the last space of installation in Prague, but because we will be indoors and out of the rain for the entirety of install. And in the Netherlands in the fall, it seems to rain a lot. 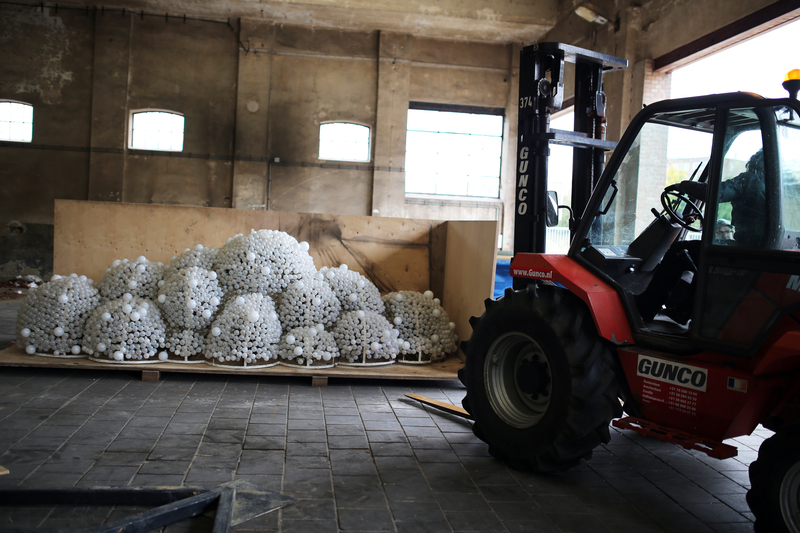 Within the first hour of unpacking the sculpture, we were ready to approach the beast with a fork-lift – a shifty operation, maxing out the forks on the lift, stressing the frame of the sculpture, and blundering uncomfortably close to the piece’s delicate skin with large, heavy tines of rusty steel. 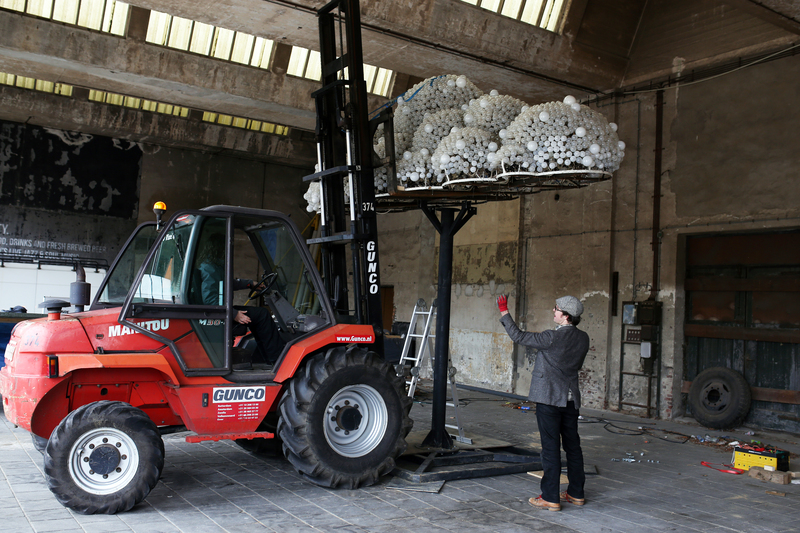 But Marco (our Dutch Assistant for the first two days onsite) operated the fork lift with steady grace, and he and Wayne approached the challenge with pragmatic optimism and enviable ease. 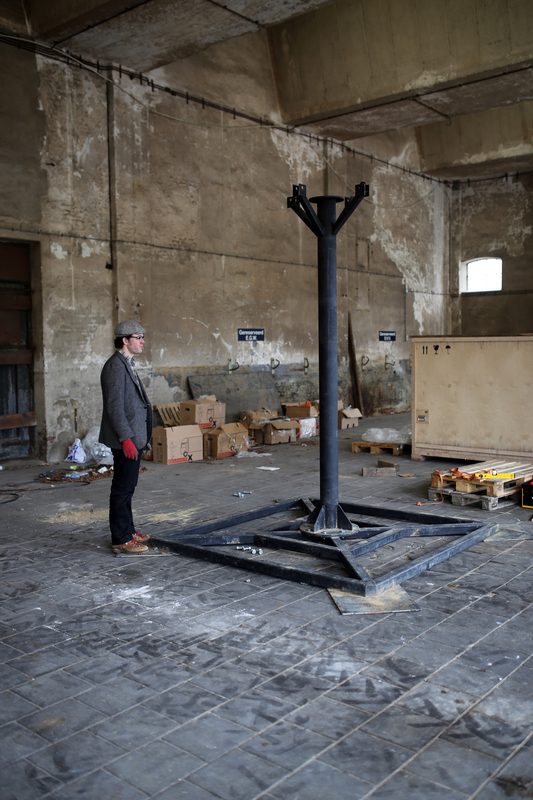 After gingerly adding the safety precaution of a household ratchet strap (just for good measure…), Wayne directed Marco as he hoisted the 400 kilo bulbous beast into the air, ferried it over to the stand, and deposited it onto the leg of the structure. 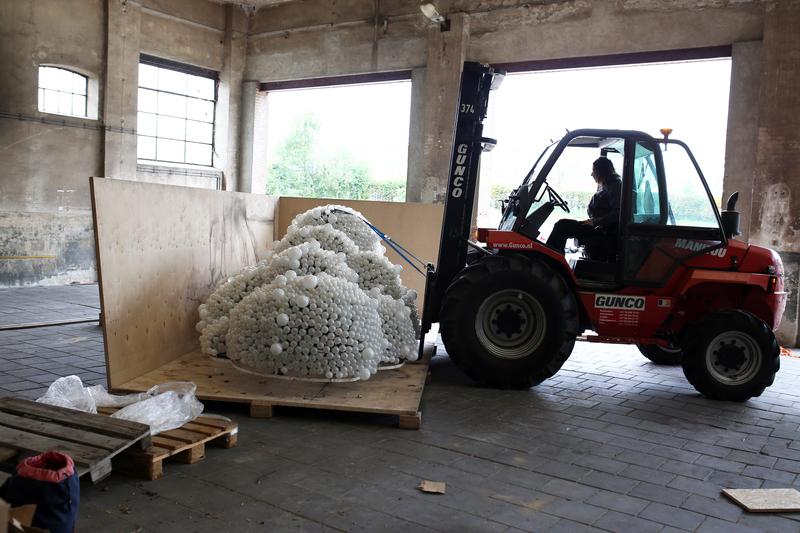 Wayne then monkeyed up the fork lift’s arm, and undid the ratchet strap, which flopped uselessly to the stone floor below. Not long afterwards, electricity was attached to CLOUD, and there was light. 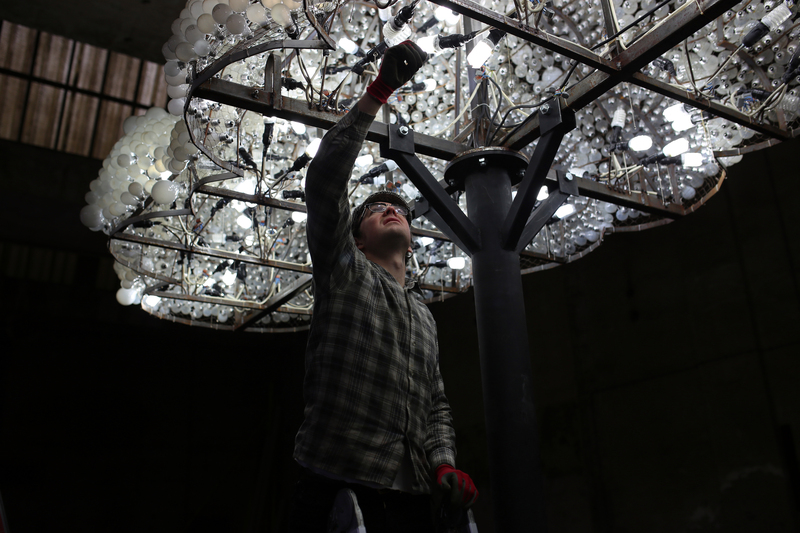 GLOW Forum of Light & Architecture opens this Saturday at 6 pm. How exciting and what luck cloud travelled so well.